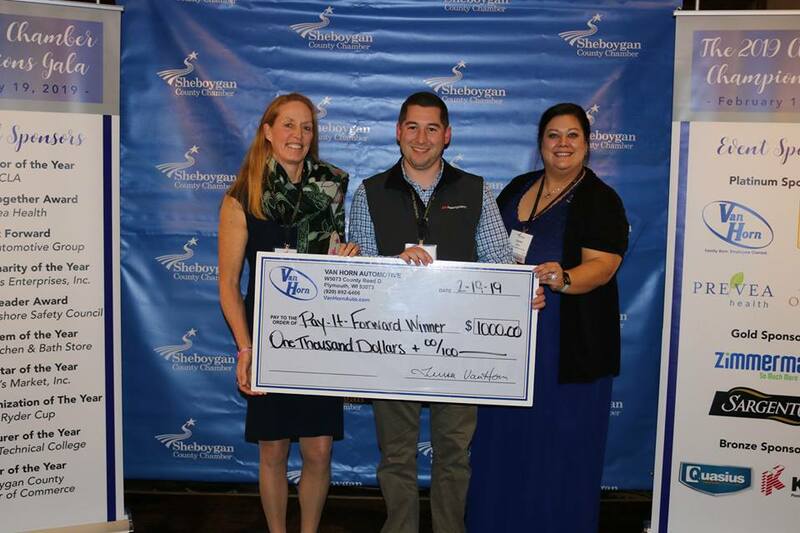 Every February, Van Horn Automotive Group Gives hosts the Pay-It-Forward moment at the Sheboygan County Chamber of Champions Gala. The Pay-It-Forward moment a random drawing, allows a Gala guest to select an organization close to them for a $1,000 donation made by Van Horn Automotive Group. Past Pay-It-Forward winners are Meals on Wheels, Sheboygan County Cancer Care, RCS Empowers, and Sharon S. Richardson Foundation. This year, Joe Widder from BW Papersystems in Sheboygan was the lucky recipient of this award. He chose Great Marriages for the donation, since his parents are long time mentors for the organization. 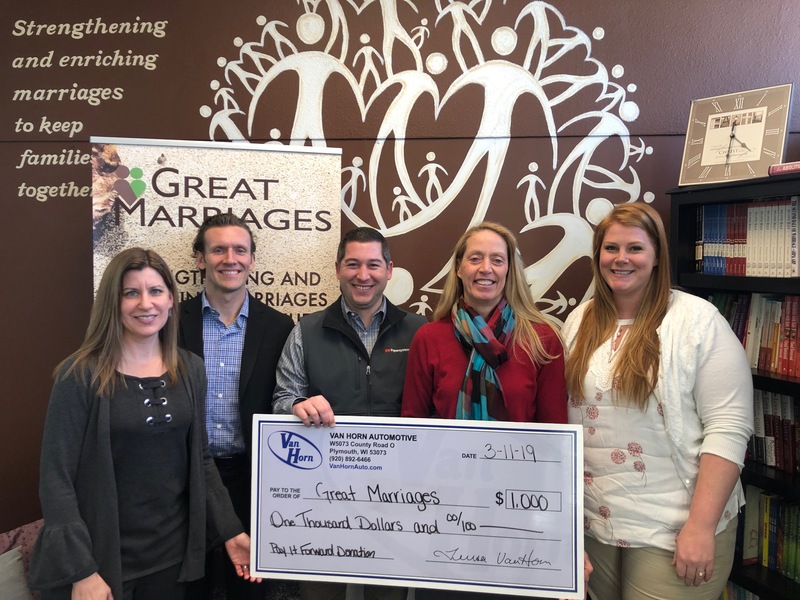 Medrek and Great Marriages associate, Winter Kohler, met with Ryan Thiel and Teresa Van Horn of Van Horn Automotive Group to present Great Marriages with the $1,000 donation. Also present for the check presentation was Pay-It-Forward winner, Joe Widder. Great Marriages accomplishes their mission through couple-to-couple mentoring programs, monthly events, marriage retreats, corporate lunch and learns, and workshops. To view Great Marriages’ upcoming events, please visit www.great-marriages.org/events or call 920.783.6142 for more information. This entry was posted on Monday, March 25th, 2019 at 2:09 pm	and is filed under Van Horn Gives. You can follow any responses to this entry through the RSS 2.0 feed. Both comments and pings are currently closed.